Last week’s king cricket quiz (Tuesday Teaser) reminded me that I still have quite a few photographs from my trip to South Africa, now 10 years ago, that I still haven’t shared. This pretty little moth is Arniocera erythropyga, which I photographed at Geelhoutbosch farm in South Africa’s Northern (now Limpopo) Province while clambering up the magnificent north-facing escarpment of the Waterberg Mountains. I saw this moth as it sat on the foliage of Grewia sp. (family Malvaceae) – fully exposed for all the world to see. If we’ve learned anything by now, we know that brightly colored insects that expose themselves conspicuously during the day are probably protected by chemical defences (or perhaps mimicking something that is). Such was the case for Bromophila caffra, an equally strikingly-colored fly that I saw on the same hike, and it is also the case for this moth as well. 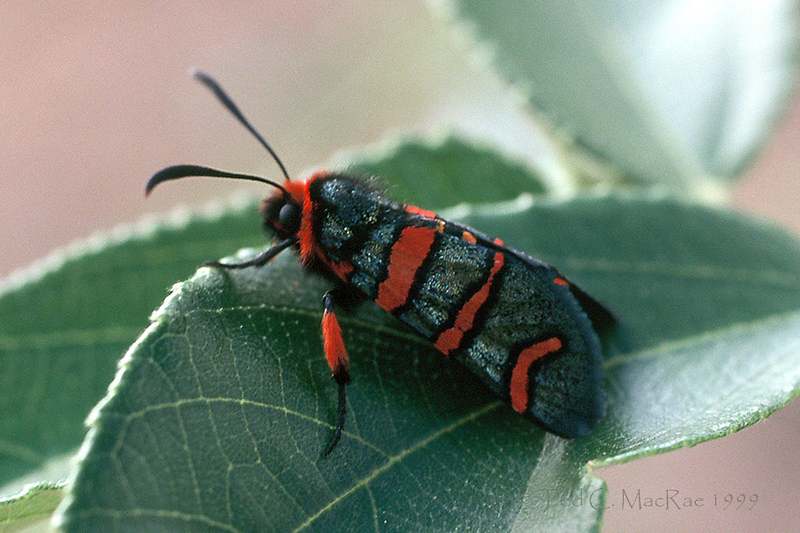 Arniocera erythropgya is a member of the family Zygaenidae, or burnet moths – many members of which are known to release hydrogen cyanide (Scholtz and Holm 1985). This is the same family to which another toxic species I featured last spring belongs (Pyromorpha dimidiata). A number of moths and butterflies in other families are also known to release HCN (produced by the breakdown of cyanoglucosides sequestered from the plants on which they feed); however, all life stages of zygaenid moths, including the egg, contain these compounds. This suggests that zygaenid species are capable of synthesizing these compounds themselves rather than needing to sequester them from their host plants (Scoble 1992). While some zygaenid larvae do feed on plants that contain cyanoglucosides, they apparently do so simply because of their tolerance to the compounds but without the need to sequester them from the plant. Thus, when I saw and approached this little moth, it didn’t flinch or flee. Protected by toxicity, it continued sitting brazenly atop its exposed perch – welcoming me to see it, daring me to do anything more than take its photo. My thanks to Roy Goff at African Moths for confirming the identity of the individual in this photograph. Copyright © Ted C. MacRae 2010. This entry was posted in Lepidoptera, Zygaenidae and tagged chemical defenses, entomology, insects, moths, predator avoidance, science, South Africa. Bookmark the permalink. Gorgeous moth! I am constantly amazed at the rainbow of colors present in the insect world! I could study bugs for a 1,000 years and never get bored! Thanks all! Back in those days it took a lot to divert my attention from beetles – it couldn’t help but be seen sitting there on the leaf like that. Did you see any oogpister beetles beetles when you were over there? No idea if that’s the correct spelling… I saw them in a recent Attenborough series, and loved they way they kick ants out of the way when being attacked (they are ant predators). They are also mimicked by a juvenile lizard. Sure did see them, and just last night I watched the Life episode that featured them – sure brought back memories! I wrote a post about them about a year ago: Tyrant ground beetles. The Darwin’s beetle footage was fantastic, and I couldn’t believe that the female got tossed too! What a gorgeous moth! And it’s interesting that they produce their own toxins rather than acquiring them (I’m not as savvy as I should be on who makes their own and who has to buy it). I’d be bold, too, if I could pull off that trick. Cyanoglucoside synthesis seems to be a zygaenid specialty among the Lepidoptera. Millipedes are another group famous for their ability to synthesize their own cyanogenic compounds. Beautiful! I love that coloration. Interesting that the legs have the same color on the hairs(?) as well. Hi Beau – yes, it sure is a looker! Hi Yen – thanks for the classification update. I don’t have any more information about this moth other than the photo and what is given in the text. Do you have a citation for the transfer of this genus to the Thyrididae?